For some odd reason I just decided to take a look at what the top 25 most played songs on my iTunes were and I thought I would share it with you. With the exception of Lady Gaga I hadn't listened to most of these songs in a few years. It's a blast from the past and I'm currently listening through the entire list. I LOVE that Beyonce's Irreplaceable is #1. I'm pretty sure that came from obsessive listening during a breakup way back in 2006. 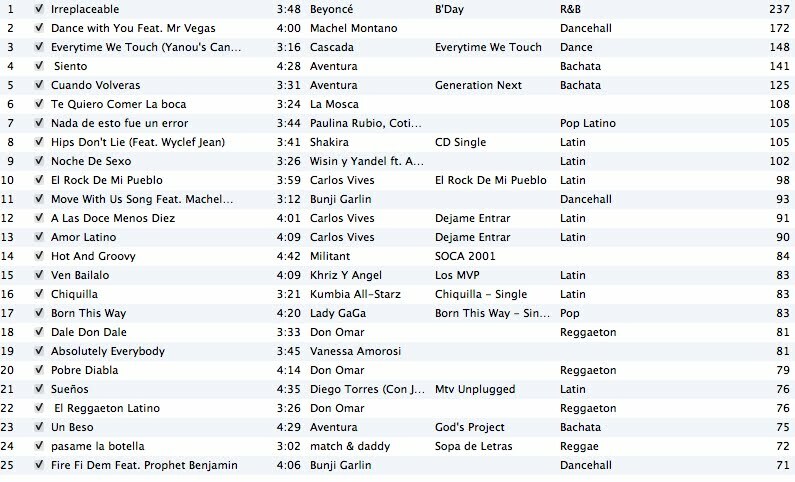 The rest is an odd mix of dance, pop, latin, soca, dancehall and reggaeton. What do you think my top 25 says about me? Are you guys familiar with all the artists? I am obsessed with that Beyonce song, love it!! I'm such a Gaga fan, and I agree- Beyonce's Irreplaceable is a great song! I dont know a lot of these singers/bands but its always fun to see what other are listening to. My top 25 is equally skewed–just imagine how much more timely your iPod or iPhone top 25 would be! interesting..am familiar with some of them!! It's open WorldWide! Good Luck! lol so random, I love it! My playlists on iTunes are never right either!